Most Pattern Imprinted Concrete (PIC) paving, and more and more block or brick pavements are treated with a transparent sealant that is intended to protect the paving from stains, inhibit weed growth, and, in the case of block paving, stabilise the jointing sand. There are also sealants specifically for use on wet-cast patio paving flags, on semi-dry pressed BS Flags, on natural stone, and almost any other form of paving. There is a selection of sealants available, and their efficacy often seems proportional to their price. However, it is essential that the correct type of sealant is used for each type of paving: a sealant recommended for PIC is not necessarily the correct sealant to use on clay pavers or yorkstone flags. Some sealants purport to be suitable for all surfaces, but, in our experience, it is better to choose a sealant that has been specifically developed for one paving type, rather than a "jack-of-all-trades". Choosing the correct sealant is critical and this is dealt with in more detail on a separate page, while sealants suitable for use with stone paving also have their own page. The remainder of this page considers the use of sealants specifically for sand-jointed modular paving such as concrete blocks or clay pavers. Sealants are increasingly specified for larger paving contracts, notably at petrol stations, where they prevent fuel from penetrating the pavement, at airports, where they prevent erosion of jointing sand by jet blast, and at ports, where they prevent the ingress of water that can cause pavement failure. They are also specified for high-use areas where cleanliness and appearance is important, such as town centres, drive-through restaurants, and railway stations, where the regular use of sweeping machines can remove the jointing sand from unsealed pavements. This growth in demand for sealants has had a twofold effect on the marketplace. While some manufacturers have undertaken intensive and original research to develop the best sealant compounds for specific applications, other, mass-market products have increased their market-share by claiming to be aone of the all-purpose products mentioned above. Sadly, some users have found out too late that the sealant they picked up as a bargain at the DIY shed has irreversibly altered the appearance of their precious paving and there's nothing they can do to rectify the situation. As with all surface treatments (including so-called Patio Cleaners, Acid Washes, De-greasers, etc), a small out-of-the-way test patch should be undertaken before applying to the main body of the paving. The most commonly specified sealants in Britain and Ireland are the acrylics and urethanes. 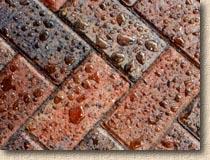 The acrylic sealants are typically used on PIC and residential paving. They are relatively cheap, but require repeat treatments at yearly intervals to maintain their properties. They are not as flexible as urethane sealants and can be adversely affected by oils, petrol and other hydrocarbons. They are best considered as 'colour enhancers'. The polyurethane sealants are much more reliable and offer longer protection, albeit at a slightly higher cost. While some of the cheaper acrylic sealants are simply glorified varnishes, these top quality products can repel oils and paints, including light fuel oils such as petrol and paraffin, prevent staining and efflorescence, and virtually eliminate weeds. More importantly from a structural point of view, they bond the jointing sand to reduce loss through erosion. Some sealants have no visible effect on the appearance of the paving whilst most impart a permanent 'wet-look', with either a gloss or a matt finish. It is the higher-spec urethane-based sealants that are specified for civil or commercial applications. There is a growing body of research showing that the use of a high-specification urethane sealant can prolong the working life of a pavement as well as reducing 'whole-life' costs by minimising maintenance and cleaning. In high water-flow areas they ensure the structural integrity of the jointing sands and therefore the pavement as a whole, and they have been shown to reduce the amount of settlement/deformation in a trafficked pavement compared to untreated block paving. Sealed block paving in a shopping area. Sealants for paving really established themselves in the Decorative Concrete market where they are an essential component of the finished work. From there, they moved into the Block Paving market, initially as stain preventers and, for concrete pavers, as a colour enhancer. Their role soon expanded as the benefits of joint stabilisation became apparent and research carried out at Luton Airport in the 1980s began to show the effect quality sealants, particularly SPPUs, could have on pavement lifespan. Sealants are proving their worth in more and more areas of the paving industry, but it is important to use the right sealant for any given paving type. A sealant that has been developed for use with PIC may not be suitable for patio flagstones, and some surfaces, such as granite or quarry tiles, may not benefit at all from the application of sealants. One of the world's leading sealant manufacturers, Resiblock Ltd, have developed sealants specifically designed to be used in different situations and on various paving materials. The legendary Resiblock 22 is a proven product on small element and block pavements, with over 2 million square metres of paving treated to date. "We have two products that are particularly suitable for this purpose, the first is Resiblock Ultra Matt (low sheen finish) and the second is Resiblock Ultra (wet-look finish). Both of these products are based on aliphatic TDI technology and provide outstanding resistance to a wide range of household chemicals whilst remaining totally light stable (critical where part of the flooring is exposed to daylight and part is in shadow). Unlike the standard products, the Ultra products have a high degree of adhesion and do not rely solely on the porosity of the substrate for mechanical bonding, as a consequence they are both particularly suitable for both wet-cast and hydraulically pressed paving. The only caveat being is that if the floors have been pre-treated with another sealer, particularly one which is silicone based, then our material may not properly adhere to this surface. Both provide very attractive aesthetics and can withstand regular cleaning with household and janitorial chemicals. As with all our products, 0.25 litre samples are available FOC to potential users to ensure compatibility." For more information on the above, visit the Resiblock website. Rule Number 1: The paving and jointing MUST be BONE DRY before applying a sealant. If I had a quid for every time someone emailed or called with a tale of woe following application of a sealant to a pavement with residual moisture, I would be able to afford a luxury weekend in Rhyl! Sealants should not be applied to any pavement that is less than 3 months old and not before all traces of efflorescence have disappeared - there's no point paying good money to seal in the efflorescence! Recent research suggests that sealing could take place as soon as 8 weeks after laying, if the paving is treated to remove all calcium carbonate from the surface, is allowed to thoroughly dry and then sealed with a low viscosity moisture-cured, cross-linking pre-polymer - a polyurethane sealant to me and thee! 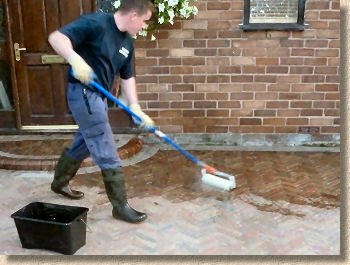 Power washing is recommended before applying the sealant, although this should be done at least 14 days before sealing to enable the bedding layer and sub-base to dry and allow for any reactive efflorescence to appear, and the lance must be kept at a shallow angle to minimise loss of jointing sand. Prior to any sealing, the pavement should be thoroughly inspected for minor faults, and to ensure the jointing is complete, ie, there is no jointing sand missing from the joints. Make sure there is no chance of rain over the next 24 hours and that the pavement is completely dry by raking out a couple of joints and checking the jointing sand 10mm or 15mm deep; if that's dry, the whole pavement can be considered dry. Sealant applied with wide-head brush or roller. The sealants can be applied by low-pressure spray, a squeegee or a long-handled roller. Different sealants recommend different application methods, so check the labelling before starting. Low-viscosity sealants can be sprayed, as long as all relevant safety precautions are followed. Application by squeegees may not leave sufficient sealant on the surface of the blocks, and therefore roller application is preferred. The type of roller used can adversely affect sealant performance if the pile of the roller reacts with the solvents in the sealant, and so, care should be taken in choice of rollers. Some manufacturers supply specialist rollers precisely for the purpose of applying paving sealants. Make sure that the sealant is worked into the joints to penetrate the jointing sand. Coverage is usually poor on the first coat, typically 2- 4 m² per litre. This coat should be allowed to dry, and then a second coat applied at right angles to the previous application - coverage should now be in the range 5-9 m² per litre. Keep free of traffic for at least 24 hours to allow the sealant to cure. New research is constantly being undertaken on the long term performance of various pavings both sealed and unsealed. There is some evidence that sealing a pavement can prevent damage by water ingress via the joints of elemental surfaces, such as block or brick paving, although how relevant this is to residential, low-traffic paving is debatable. PIC has no option; they must be sealed, if only to make the colours look acceptable. We are not big fans of these sealants for normal, domestic applications, although we fully appreciate their benefits and endorse their use on public works, high traffic areas, fuel stations etc. The good quality polyurethane sealants are relatively expensive, costing £2 and more per m² treated, but latest research is indicating they have a lifespan of 10 years or more, whereas the cheaper acrylics might be only half the cost but the paving usually has to be re-sealed every 12-36 months. Whether these sealants represent a good investment for residential paving can only be determined by the client, but some will consider it a small price to pay to protect and preserve their paving. However, they can be a worthwhile investment if you are protecting valuable or 'hard-to-replace' types of paving, such as custom-manufactured blocks or PIC. For high-load or heavy-traffic applications, they are becoming essential, and in town centres, they not only keep the paving clean, they all but eliminate the risk of damage to the jointing caused by mechanical sweepers and high-power water jet cleaning techniques. For the homeowners, the main attraction of a sealant, other than stain protection, is that the better products do reduce or eliminate any colonisation by weeds, thereby reducing the chore of regular maintenance, and they can also prevent 'mining' of the jointing sand by ants or other invertebrates. 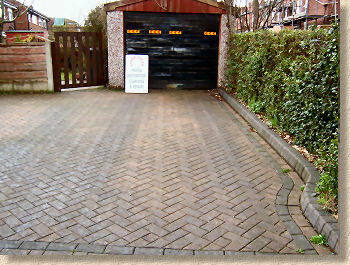 One area of growth for sealants is in driveway refurbishment. As the number of block paved areas older than around 10 years has grown, owners have realised that seaalants offer an effective method of reducing regular maintenance, by keeping the surface clean and free from weeds. 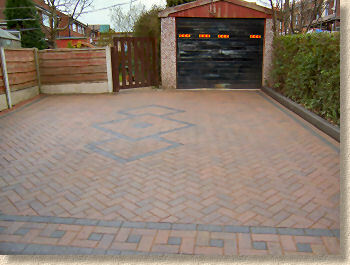 Accordingly, a number of companies offering just such a driveway refurbishment service have magically appeared, often with grandiose names suggesting some level of professional expertise that is difficult to credit when a spotty 17 year old is blasting out all of the jointing from the driveway with a jet washer. However, when undertaken properly, there can be no doubt that a wash-and-brush-up followed by the application of a quality sealant can completely rejuvenate a tired-looking block driveway and usually at a quite reasonable price. The key to success is to find a professional contractor who understands paving as well as cleaning, and is willing to give the project the necessary time between cleaning and sealing to ensure the very best of results. Be wary of 'cleaning-only' companies: there's a knack to cleaning paving and keeping it in tip-top condition. In summary, if a sealant is to be used on any paving, it's well worth spending a few bob extra and getting a quality product, rather than trying to do it on the cheap and then being clobbered with re-application costs in the none-too-distant future. For small areas of staining on unsealed projects, it is often a simple task to replace individual stained blocks as and when required. Follow every step of the application of a good quality sealant to a block paved driveway on the Driveway Refurbishment Project page. See the Links page for details of sealant suppliers.